With a resolution of 1280×800, the 10.1-inch display of the Lenovo Miix 320 is not bad at all for the price. It won’t fail to light up everything in rich, vibrant detail, and it’s good enough for everyday use. The touchscreen feature is particularly exceptional. It tracks all taps accurately and recognises swipe-in navigation gestures with absolutely no lag! The design of the Miix 320 follows the standard hybrid model with its screen attaching to a physical keyboard dock. 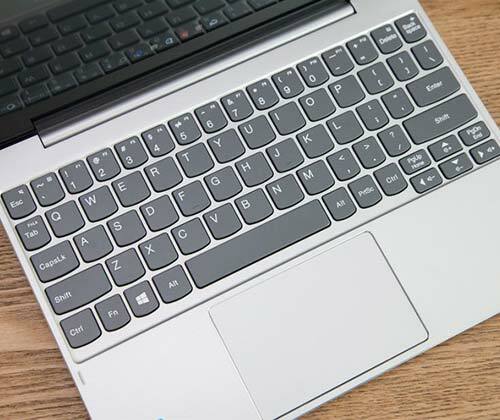 Although it is mostly made of plastic, the shell of the 2-in-1 laptop looks far from cheap. The shiny, bevelled edges with the sparkling, tapered shell make the device look like a sibling of the Apple MacBook. Weighing just over 1kg with a depth of merely 17.5mm, the Miix 320 is built to travel. You can totally fit it into your backpack and carry it with you wherever you go! The detachable island-key keyboard isn’t anything revolutionary but it’s comfortable enough to type on. It’s got 1.2mm of travel, which is obviously better than thinner keyboard covers. The only problem with the keyboard is the keys may feel a little bit cramped if you’ve got larger hands. As for the touchpad, it accurately tracks input and is able to enact multi-touch commands without incident. Whether it’s two-finger scrolling or 3-finger swipes, the 3.5×2.3-inch touchpad has no problem registering. At the heart of the Miix 320 is an Intel Atom x5 quad-core processor accompanied by up to 4GB of RAM, giving you the technology and processing capabilities to handle moderate multitasking. 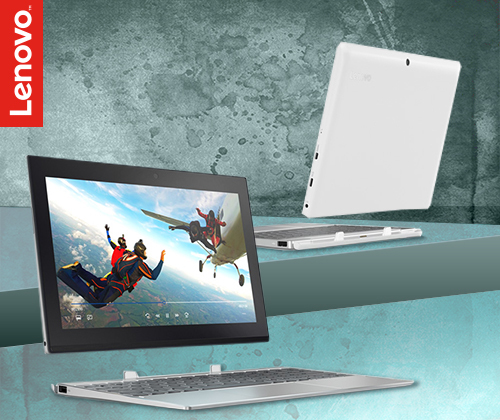 The laptop is able to stay responsive with multiple tabs opened – perfect for daily browsing and media handling! The up to 128GB of eMMC storage provides plenty of space for your collection of music, movies and documents. If you’ve got a lot of data to store, you can always get yourself an external hard drive, but again for a budget 2-in-1, 128GB of eMMC is pretty reasonable. The Miix 320 offers a battery life of up to 10 hours with a single charge, which is utterly impressive. It totally allows you to be on the go from morning to night without wasting any time looking for a power socket! In the battery life department, the Miix 320 is hands down giving you more than what you pay for. 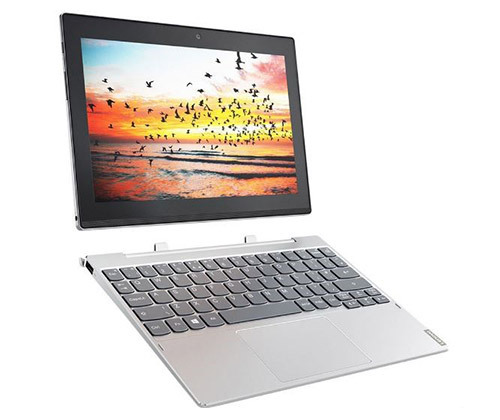 The Lenovo Miix 320 is a great convertible built for buyers on a budget. Despite its affordable price, you’ll still be getting decent processing power, solid built quality and an above-average display. 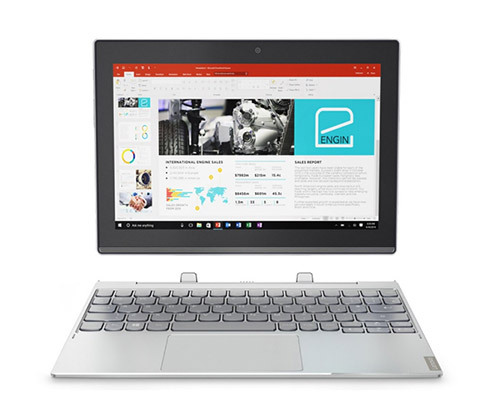 Get your hands on the Lenovo Miix 320 here at Laptop Outlet today! 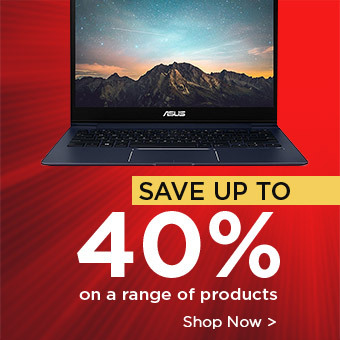 Check out our full range of Lenovo laptops here. For more updates on latest releases, top picks, helpful reviews and other tech news, visit our blog.